Dice up the onion, chop up the broccoli, mince the garlic, chop the jalapeños. Saute the onions in some oil until browned. Add the quinoa and toast it up for about 5 minutes. Add the garlic and cook 1 more minute. Add in the milk, broccoli, jalapenos, and cheese (reserve 1 cup of cheese for topping the dish). Stir well and remove from heat. 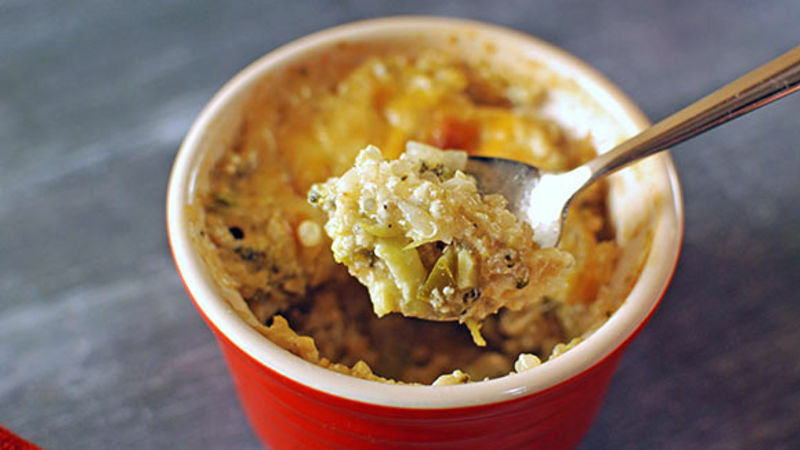 Ladle into individual ramekins or a baking dish and top with the remaining cheese. Bake at 350°F. If using ramekins, bake about 25 minutes, if in a large baking dish it will be closer to 45. Bake until top is browned, quinoa is tender, and liquid is evaporated. For the past few months, I have been eating really healthy. I can't compromise on flavor when I eat healthy food. When I do, I end up bingeing on junk food a few hours after the meal! This Cheesy Spicy Quinoa and Broccoli is the perfect example of a delicious healthy meal keeps me satisfied for the rest of the night. It’s loaded with veggies and healthy whole grains, and will help you get over your mac and cheese craving. Oh, and did I mention it only requires about 15 minutes of prep and can be on the table in less than an hour??? First, rinse the bitterness off the quinoa. Then toast it up with some onions. Meanwhile, chop up some pickled jalapenos. Milk, broccoli, and jalapenos in the pot. Dole it out into ramekins and pop into the oven. Cheesy, creamy, and loaded with flavor! Dan Whalen thinks ramekins make food taste better. He has been blogging for over 4 years at The Food in My Beard; check Dan's Tablespoon profile often to try his recipes with creative international spins!